A luxurious modern villa with pool, Jacuzzi and superb sea views in exclusive Kommeno. With its spacious layout and immaculate finish and its beautifully decked, sea-view pool area, Elektra is the perfect residence for those seeking a touch of class and elegance at the heart of one of Corfu’s most exclusive neighbourhoods. With the option of lounging on the tranquil terrace and basking in the far-reaching sea views, spending time in historical Corfu Town or heading to a superb selection of nearby beaches, guests staying at Elektra are truly spoilt for choice. Inside: the main entrance at Elektra takes guests into the bright open-plan living and dining area, furnished with contemporary elegance and featuring hardwood parquet floors, a fireplace and superb views out to sea via the wall-to-wall sliding glass doors, which also provide seamless access to the outdoor terraces. Just off this area is the well-equipped kitchen, which opens onto the al fresco dining area and pool beyond. The ground floor is also home to one of the bedrooms, a double, with its own en-suite bathroom with tub and shower attachment, and a guest bathroom. Stairs lead up to the first floor, where there are three more bedrooms: a master suite with en-suite bathroom with tub and separate shower, and a double and a double-twin with en-suite bathrooms with tub and shower attachments. The master suite and the double have floor-to-ceiling sliding glass doors that open onto balconies delimited by transparent panes of glass that help make the most of the views. All three of the upstairs rooms have superb, inspirational views out to sea, the Greek mainland and Corfu Town just to the south. Outside: running along the front of the house, and offering incomparable sea and coastal views, is a shaded outdoor living and dining area, fully furnished for relaxing and enjoying long, lazy meals. Access is from the large open-plan reception room and also from the kitchen which directly serves the al fresco dining table. Continuing on from here, one immediately comes to the decked pool area, which features a delightful pool, yet more sea views and plenty of comfy loungers. As with the upstairs balconies, this whole area is delimited by glass, ensuring that, wherever you are or whatever you are doing, you will not miss out on the views! The icing on this already extremely rich cake, is a raised Jacuzzi hot tub, strategically placed... yes you've got it... to enjoy those stunning vistas! Elektra is one of three independent villas within an exclusive gated property but is not overlooked and enjoys full privacy. Elektra is situated in the exclusive area of Kommeno, just 11km (a 15min drive or taxi ride) north of Corfu Town with its excellent range of shops, restaurants, bars and nightlife. A path of about 150m leads down to a sea gate, from which about 80 steps will take you down to a little pebbly bay (not the best beach in Corfu). Also within easy walking distance (about 400m) is a boat hire company, while there is a selection of tavernas and restaurants within 700m-800m from the villa (along an road without pavement). Just a few km down the coast, on the way to Corfu Town, is Gouvia, a mecca for sailors, with good beaches and excellent watersports facilities. There are also plenty of activities for kids nearby. 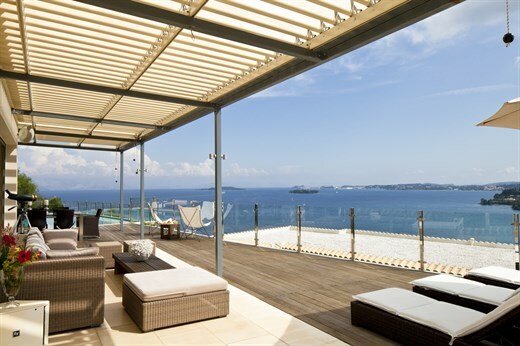 "Elektra is an excellent villa with fabulous views." Elektra was wonderful! We loved everything about it. The house itself was lovely and in wonderful condition. The setting, grounds and view were fabulous. The staff AND owners were warm, helpful, welcoming and caring. We were very pleased with Elektra and the service you gave us. The brochure photos do not do Elektra justice. We had a very memorable holiday. There is nothing we did not enjoy. The housekeeper and cook at Elektra was excellent. The meals we had for three nights there were the best we had in Corfu. If there were not so many other places to experience we would return to Elektra and Corfu. We loved Elektra - and especially the housekeeper. We thoroughly enjoyed the beauty of the islands - especially from Elektra! We can't wait to return! Elektra is an excellent villa with fabulous views. Overall we had a great stay at Elektra... We had a dinner prepared by a cook. It was really good food. For the most part the experience was superb... The views are great.